The top US Commander in South Korea was notified of the plan to establish a no-fly zone over a cross-border region well before the two Koreas announced it during the inter-Korean summit in September. 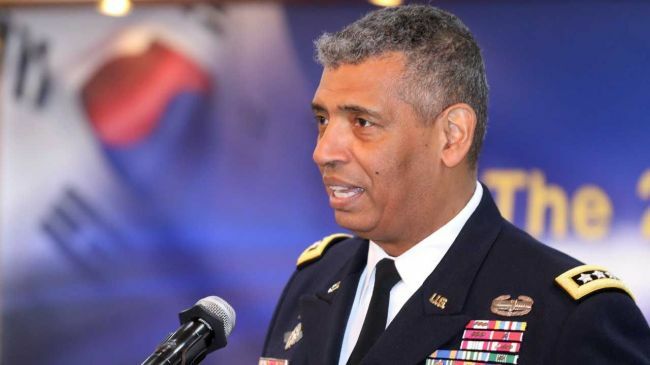 According to a source familiar with the bilateral consultations, US Forces Korea Commander Gen. Vincent Brooks met with South Korean general Kim Do-gyun in August to discuss South Korea’s push for a comprehensive military agreement with North Korea. During a closed-door meeting held at USFK headquarters in Seoul, Kim, who deals with North Korean issues at the Ministry of National Defense, briefed Brooks on the plan to establish a no-fly zone and other measures intended to prevent hostile acts along the land and maritime border. “Kim came to Gen. Brooks’ office multiple times before the Pyongyang summit,” a source told The Korea Herald, requesting anonymity due to the sensitivity of the issue. The chiefs of the two Koreas’ militaries signed the military agreement Sept. 19 in Pyongyang. However, the meeting stopped short of eliciting immediate approval from Brooks, who doubles as commander of the United Nations Command, the source added. The US-led command administers the southern side of the DMZ, and activities inside the region require its approval. Conservative opposition parties have criticized the decision to establish a no-fly zone, as well as other steps taken to ease tensions with North Korea, saying the inter-Korean agreement was reached without sufficient coordination with the UN Command. While the US Seventh Air Force had expressed frustration over the lack of information-sharing, the source said, the USFK concluded after the Pyongyang summit that the no-fly zone posed no significant problem. The agreement includes setting up a no-fly zone, as well as maritime and ground buffer zones around the heavily fortified Demilitarized Zone. The two Koreas also agreed to stop military drills near the Military Demarcation Line that runs within the DMZ. The measures took effect Thursday. Inside the no-fly zone, the two Koreas are prohibited from flying fighter jets, helicopters, drones and balloons. The zone extends 40 kilometers north and south of the Military Demarcation Line in the east and 20 kilometers in the west for fixed-wing aircraft. The Defense Ministry said Wednesday that the UN Command has expressed support for the inter-Korean military agreement and the two parties will continue close coordination. “Through various occasions, the UN Command has been constantly expressing support for the complete suspension of hostile acts by land, sea and air and other relevant measures,” the ministry said in a statement.